I have a continuous dependent variable (e.g. range size) and a few "independent" variables (e.g. body mass, encephalization ratio), and I want to test how the rate of evolution of the dependent variable is affected by the independent variables. The PCMs that I'm familiar with cannot be used to answer this question, because they usually try to predict the dependent variable based on the independent variables (e.g. PGLM) instead of looking at the rates of evolution. What about the admittedly ad hoc approach of computing the correlation between the states at ancestral nodes for x & the squared contrasts for corresponding nodes for y? Then you can generate a null distribution for the test statistic (say, a Pearson or Spearman rank correlation) by simulation. This seems to give reasonable type I error when the null is correct, and when I simulate under the alternative (i.e., the rate of Brownian evolution along a branch depends on the state at the originating node) it sometimes is significant. Here is the function I proposed and submitted to the list to do this, I have since posted a more sophisticated method & function here. So it would seem (based on these very limited simulations) that the method has type I error near or below the nominal level. Furthermore, the power is not too bad when the alternative hypothesis is correct. 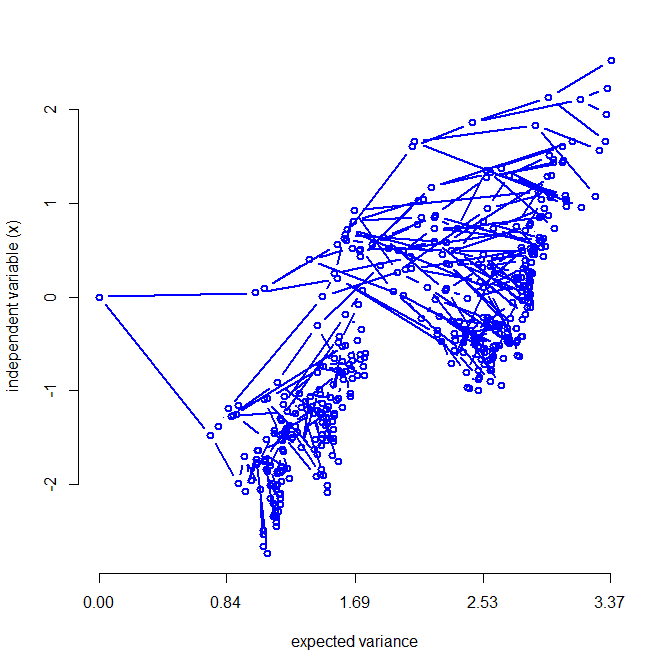 Finally - the mean slope of the regression between contrasts variance and ancestral states is actually very close to our generating relationship - in this case 1.0. Obviously, as you say, this clearly does not represent a full exploration of parameter space, but this seems to work (perhaps somewhat surprisingly) well. Thanks for the post. (Just posted this to Google+ to spread the word). I think the other responses to the original post are also pretty clever and deserve a second look. See a follow-up & update here.